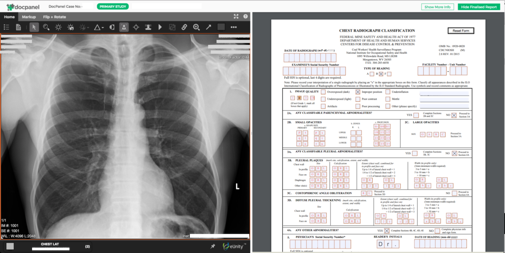 July 11, 2018 -- Teleradiology services provider DocPanel has launched a new service to provide interpretations of chest x-rays acquired under the U.S. government's B-reader program to screen coal miners for black lung. DocPanel's service will offer a panel of radiologists who are certified by the U.S. National Institute for Occupational Safety and Health (NIOSH) to interpret chest x-rays for signs of black lung, as well as other pneumoconioses, such as asbestosis and silicosis, which are caused by the inhalation of dust. Black lung, or coal workers' pneumoconiosis, is common among workers who have spent years underground and is caused by the inhalation of coal mine dust. The B-reader program was set up in 1979, but there is currently only a small number of active NIOSH-certified B readers. What's more, simply getting a B-read interpretation is difficult, according to DocPanel: It requires mailing plain-film radiographs or CDs with digital x-rays to B readers, who must interpret the x-rays, fill out a paper form with their interpretation and classification of the image, and mail it back. Instead, DocPanel has set up an online system that enables users to upload digital chest radiographs from a CD, PACS, or DICOM file/folder to a secure account. The images can then be interpreted by a B reader contracted by DocPanel who fills out and returns the required forms. DocPanel is offering the service to occupational health centers, imaging centers, law firms evaluating client cases, and epidemiological research studies, as well as surveillance and worker monitoring programs. In addition, other B readers can use DocPanel's services to streamline their workflow and give their clients quicker turnaround times.